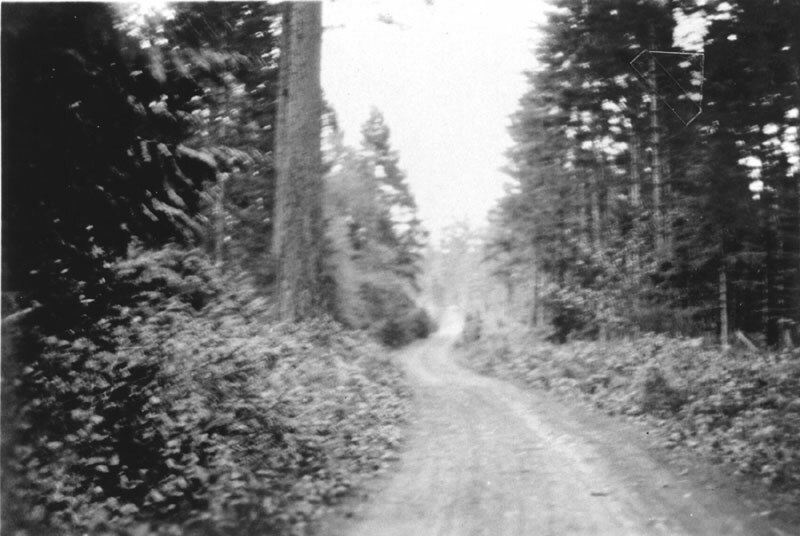 Gabriola’s archives contain hundreds of photographs that reflect the Island’s rich history and provide a glimpse into lives of the past. 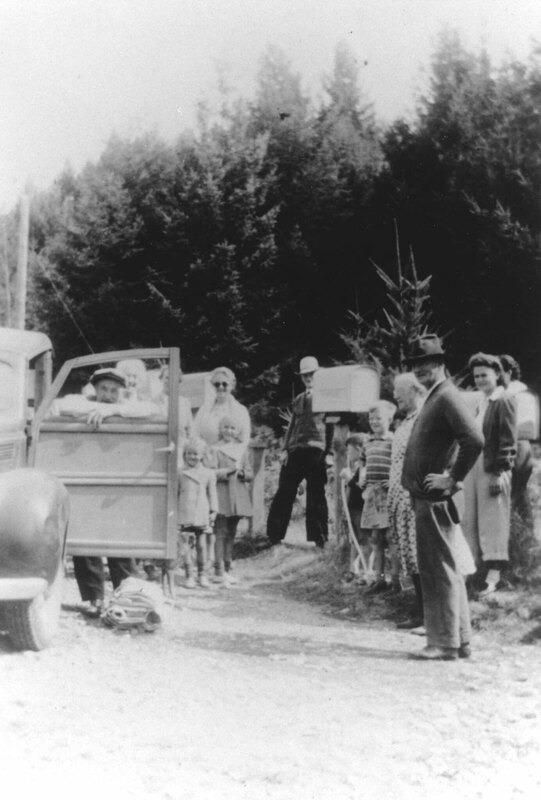 One can only imagine the stories behind the photos below: voters on Election Day; settlers waiting for mail at Gossip Corner; children dressed in May Day finery; farmers in their Sunday best on their way to Church; Gabriola soccer players posing for a team photo. 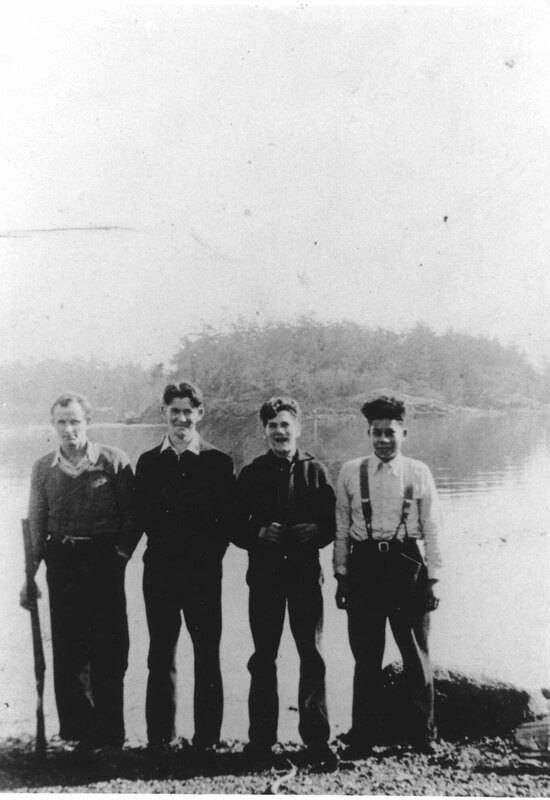 Black and white photo of four teenage friends at Silva Bay. 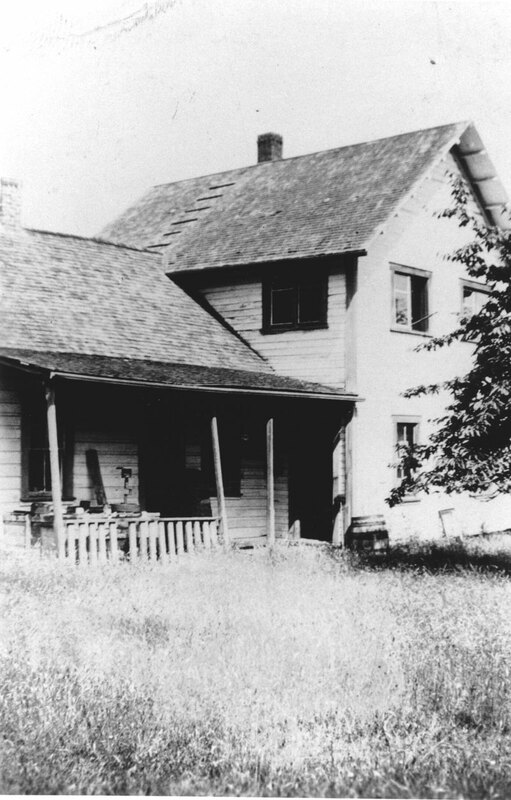 Black and white photo of the Hoggan homestead. People are standing outside on the porch. 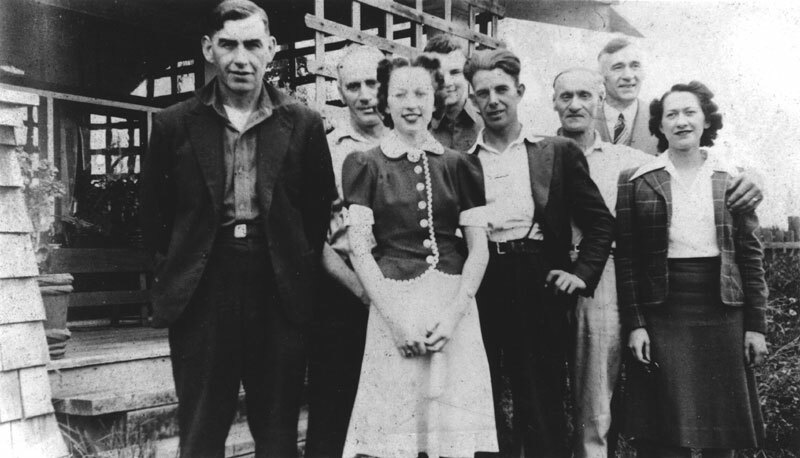 From left to right: Caleb James Deeming, Albert James Deeming, Alexander Hoggan, Christina Hoggan and Sarah Deeming (nee) Hoggan. 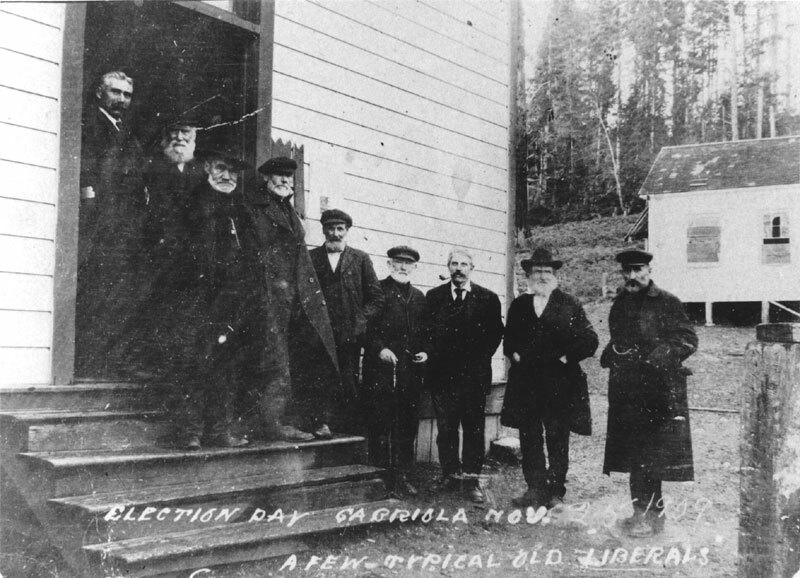 Photo of election day, 1909. This was a Provincial general election which returned 38 Conservatives, 2 Liberals and 2 Socialists. Left to right: James Degnen, Richard Chapple, James Lewis, James McLay, John Silva Sr., Thomas Degnen Sr., John Cox, Michael Manley, W. Clark. 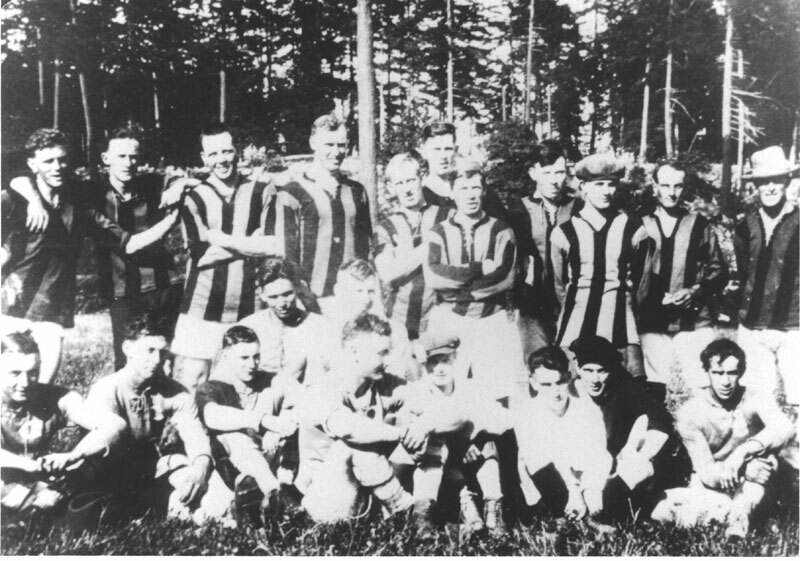 Written on front: "A few typical old Liberals"
Gabriola South School in background. 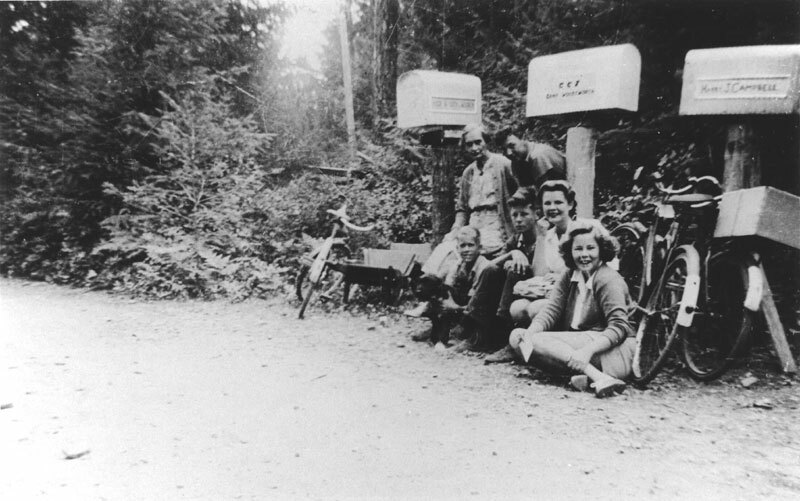 Black and white photo of the Law family,torn left and right corners and top left middle. Written on back in ink: "The two girls are Gwyneth and Betty Law but don't know the rest. Some of the Laws I think." Signed by "Mini." They are located at Silva Bay. 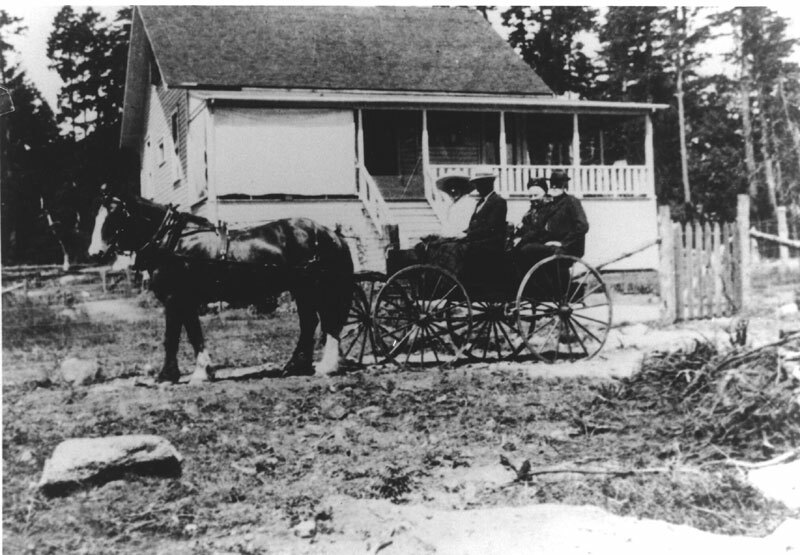 Black and white photo of two couples in a wagon. Mr. and Mrs. Law are in the front seat and Mr. and Mrs. Stenhouse are in the back. Silva Bay house, family farm - five bedrooms. 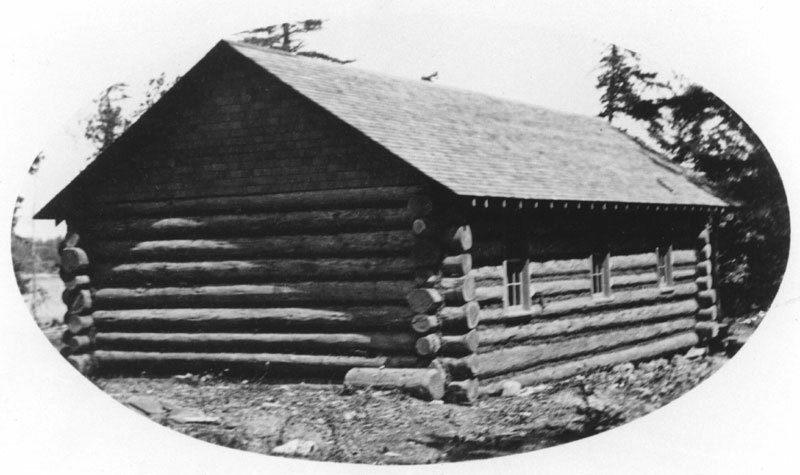 Written on back: "The Old House"
Photo of log church on Gabriola. Rev. Thomas O'Donnell (Bishop of Victoria) at right. An automobile to the left. 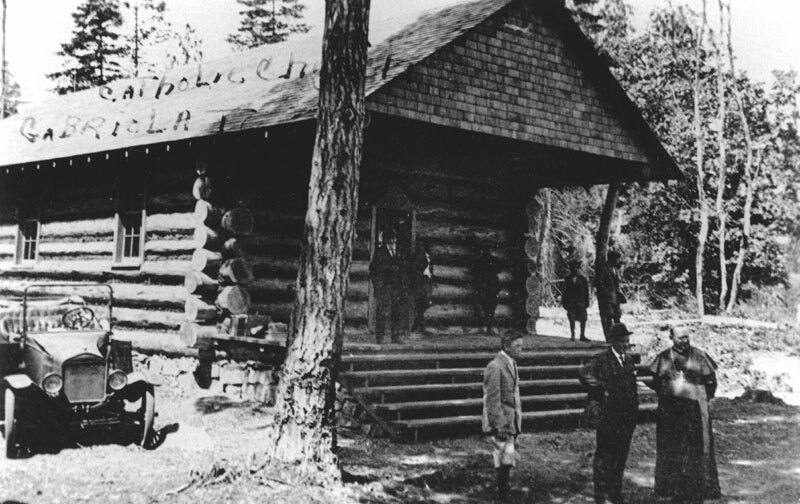 "Catholic Church Gabriola Is." is written over the roof. 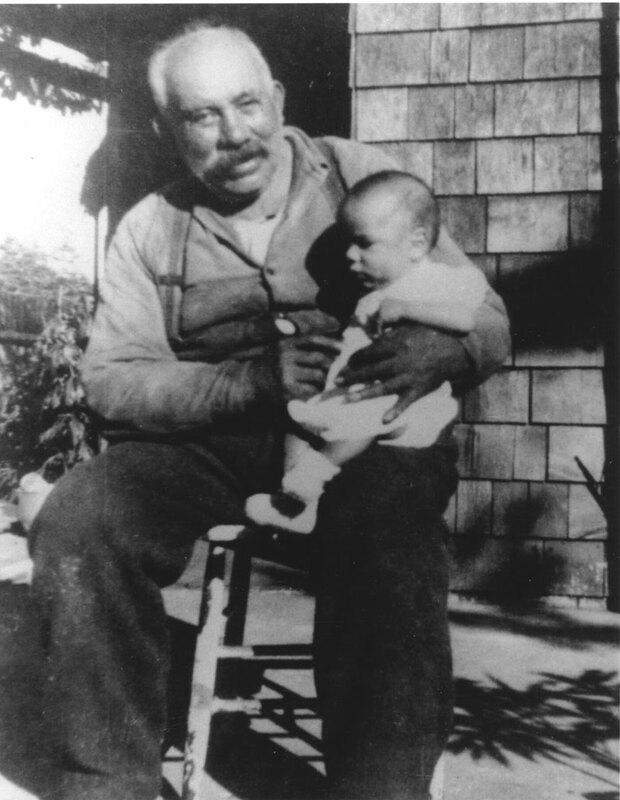 Joseph Silva with his grandson, Tommy Moore. 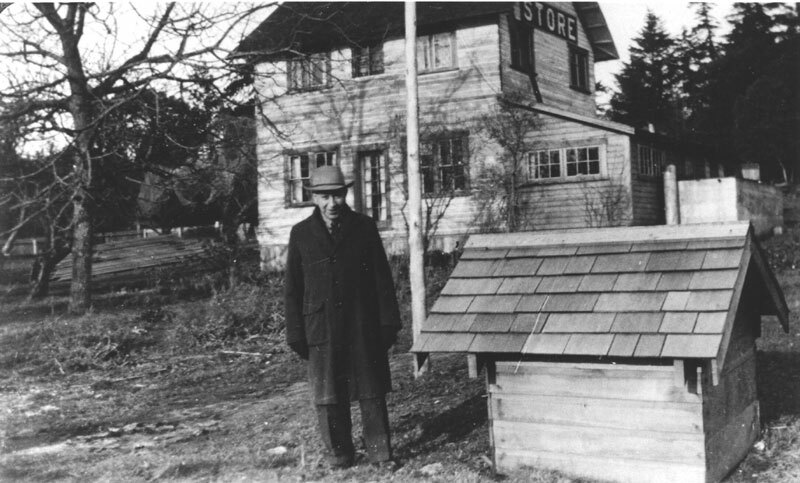 Picture of Lewis Silva standing in front of his house and store located in Silva Bay.According to Joe and Hertha Davis it was sold with 72 acres of land to Sears in 1938 for $1,500. 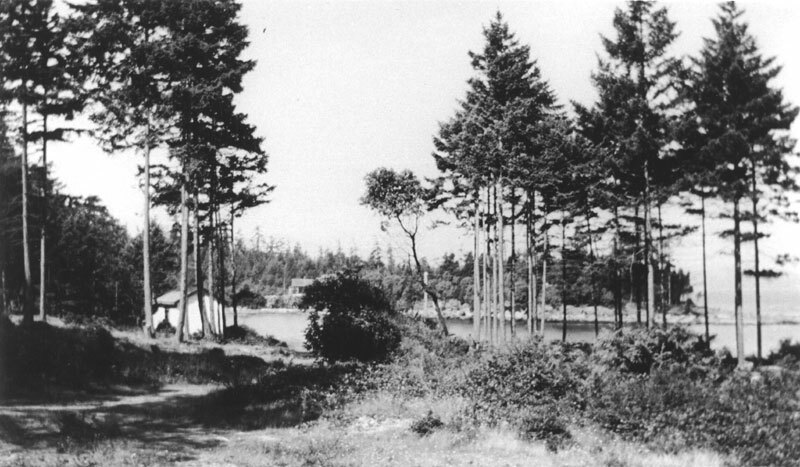 The store is where the Silva Bay Resort is now located. 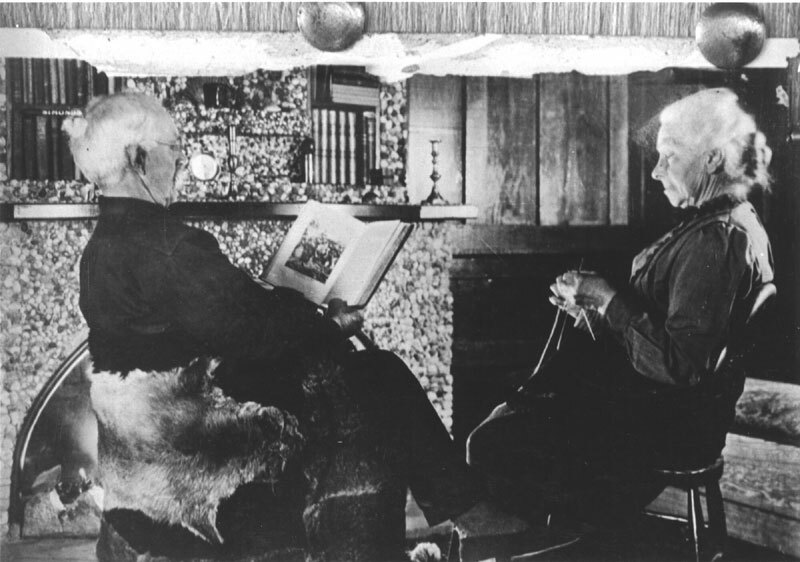 Black and white photo of a photo of Helen and Thomas Coats sitting side by side, he reading, she knitting.>br />On back, in ink: "Helen and Thomas Coats"
Gossip Corner with TP Taylor's mail truck in forefront. 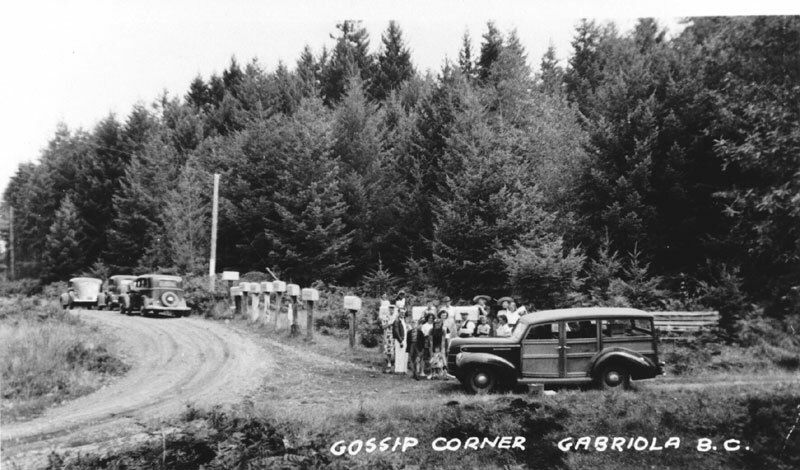 Gossip Corner with mail car and 12 adults and children standing around the mail boxes with T.P. Taylor leaning on the open car door. 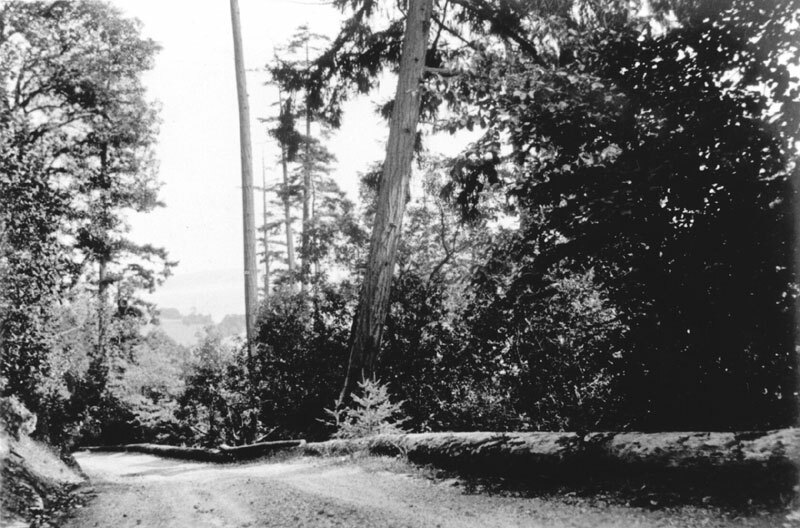 Photo of Chatterbox Corner on Berry Point Road and Norwich Hill. People in photo are: Philip Keatley, Win Gardiner, Phyllis Darling, Sheila Darling, John Harvey and Mrs. Bennet. 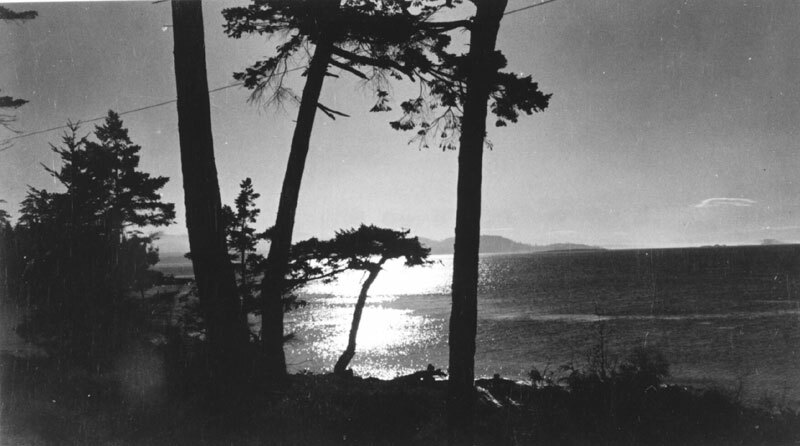 View from Anderson Lodge (now the Surf Lodge). Photo of the McConveys and Edgars. 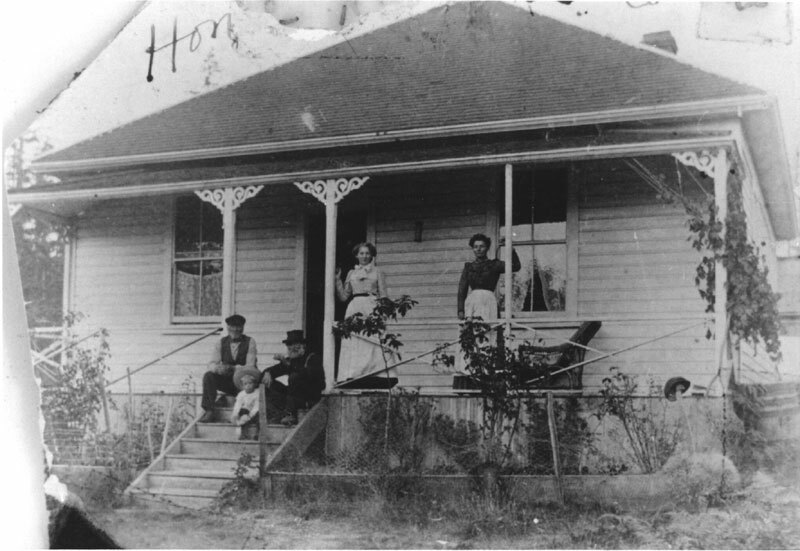 Eight people standing in front of a porch. On back in ink: "1. Wm. McConvey 3. Stan Finnamore 4. 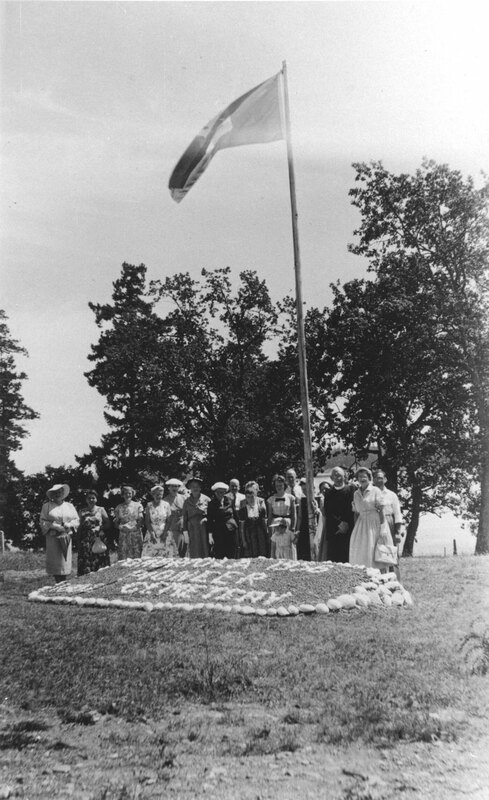 Harry Finnamore (woman possibly his wife Vera, nee McConvey"
Photo of May Day in 1948 at the North End School. On the steps: two unidentified children and an unidentified man at the top of the steps (Les Withey? Miss F. Pullan? 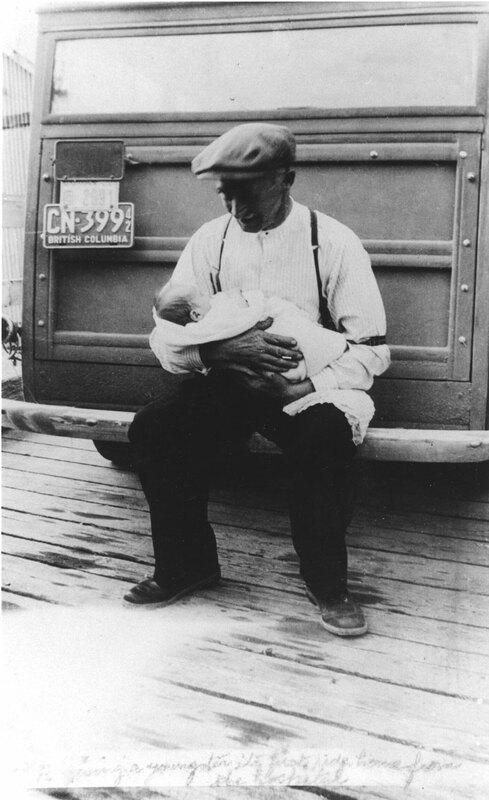 ), Frank Hiley, Mrs. Irene Cox and Mrs. Katie Baldwin holding Jack and Irene Cox's daughter Linda. 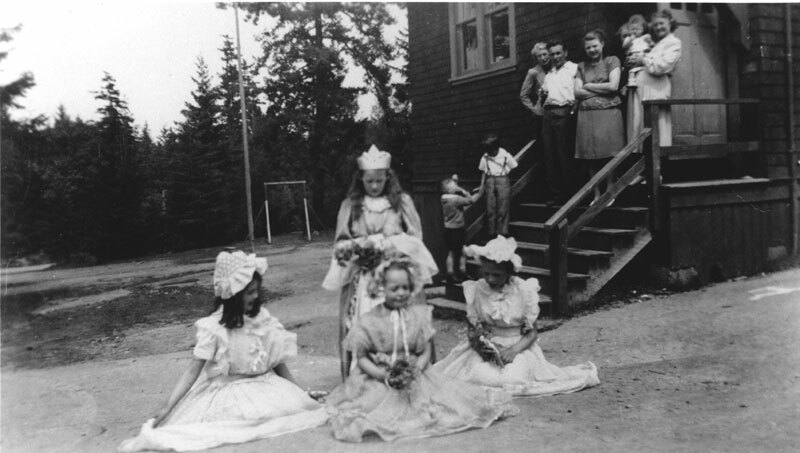 On back: "Gabriola Nth End school May Day 1948. Frank, Irene & Mom holding Linda on the steps." 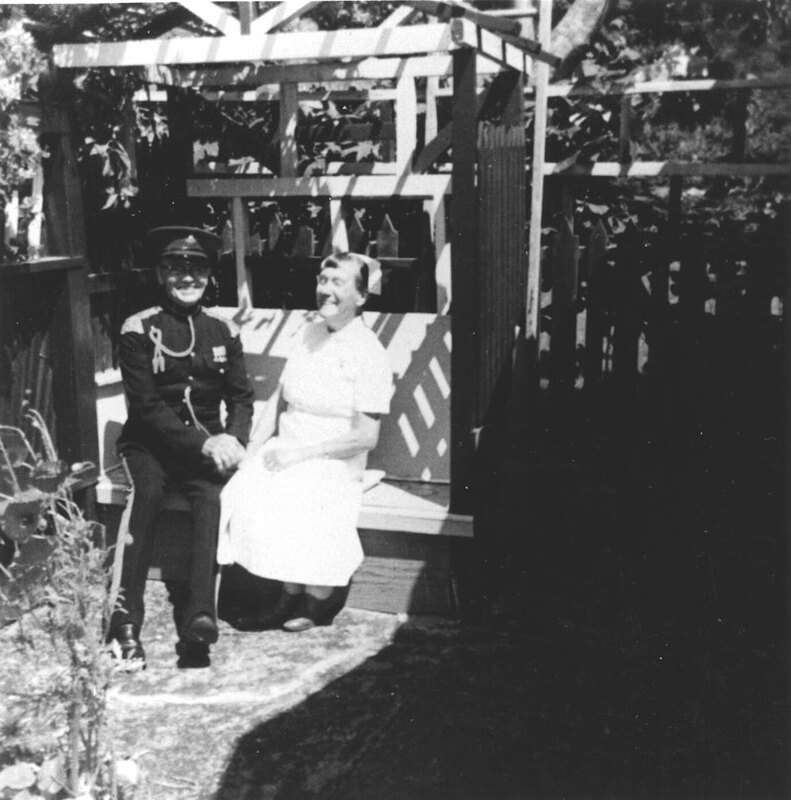 Photo of Hulmes sitting on bench enclosed area out of doors, he in uniform, she in nurse's uniform, holding hands. 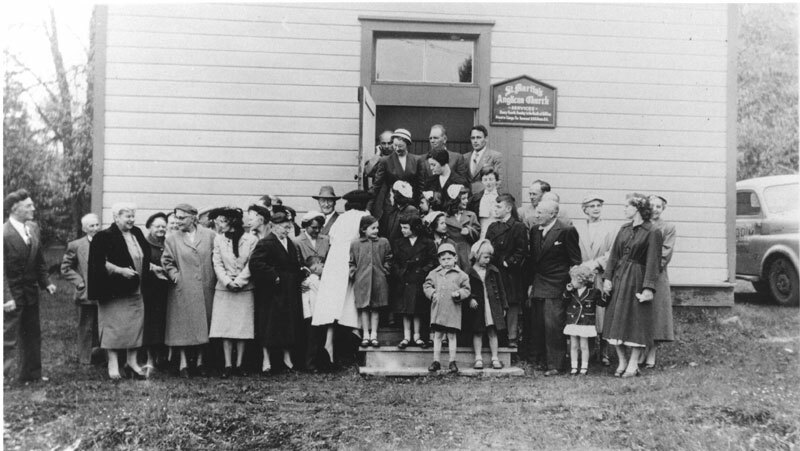 Black and white photo of a large group of people standing outside the St. Martin's Anglican Church. On back: "Easter Sunday April 21/57. 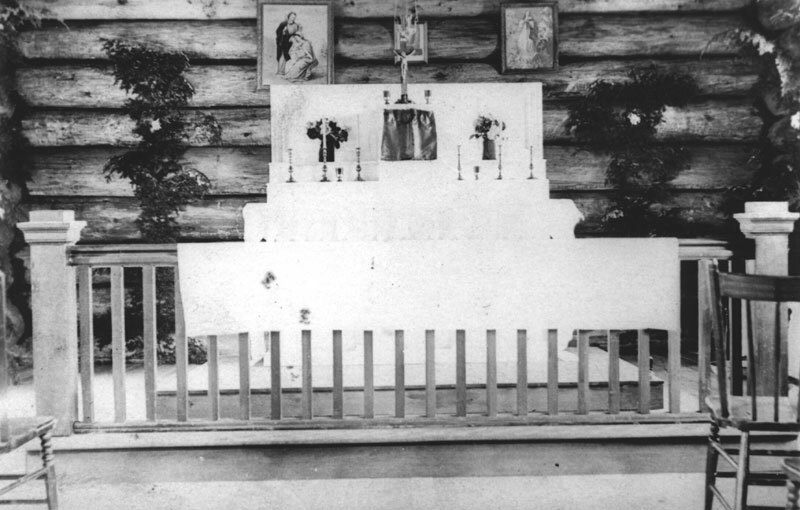 -- Dedication of the Cross and Bible -- Fred Withey"
Photo of the dedication of the Gabriola Cemetery. 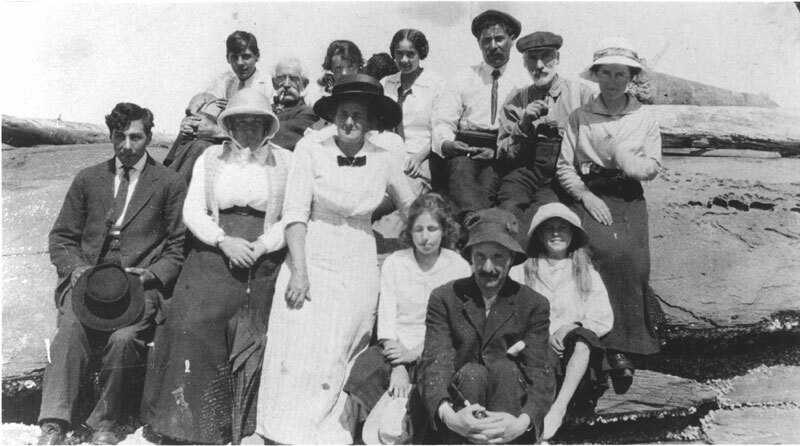 Several people have been identified: Nancy Stokes, Lily Gray, Eleanor (Tella) Holland, Maudie Gray, Len Dobinson, Sheila Dobinson and Peter Bell. Potato digging, people are most likely the Rollo family. 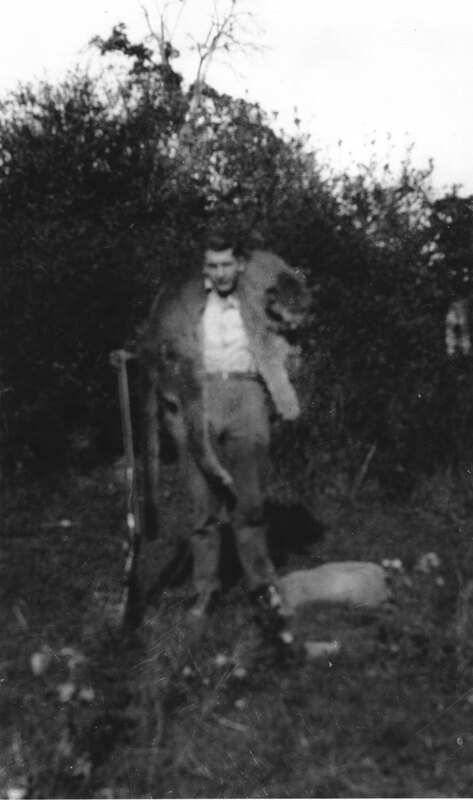 Photo of four adults and three children (one female child on horseback) standing in a field; one male child holding a rifle or shotgun; all picking potatoes. 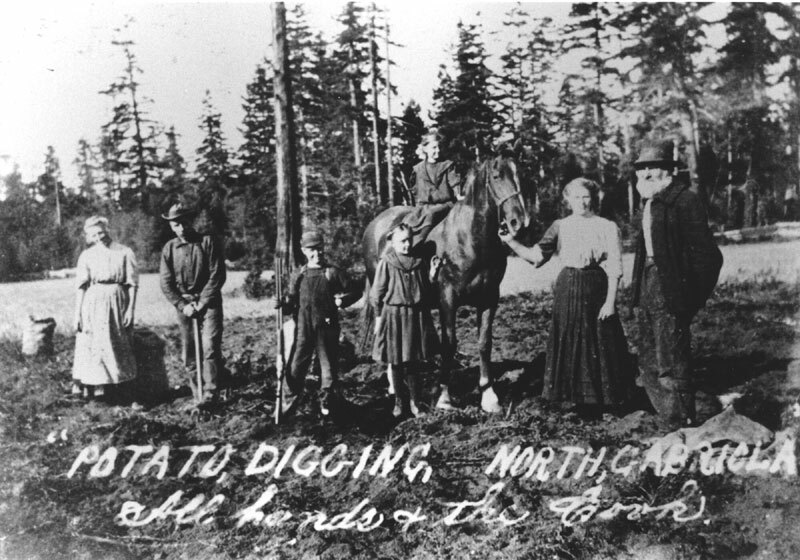 The caption below, in white says: "potato digging, North Gabriola All Hands & the Cook"